Top 10 Sound-bites Overheard at The Pulpwood Queens Girlfriends’ Weekend! 8 ) “My dream was that kids would read my book and get the same joy as I got from A Tree Grows in Brooklyn” We all know Jeannette Walls as the best-selling author of The Glass Castle and Half Broke Horses ( a BCC Top 10 picks for 2010.) 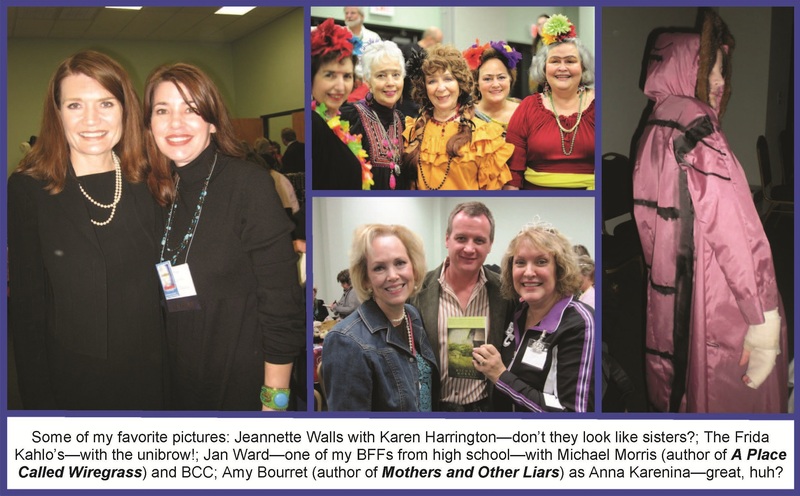 However, this weekend she was not only the winner of the PWQ Bonus Book of the year for Half Broke Horses, but she also learned that the PWQ of East Texas received a literacy grant to place 100 copies of The Glass Castle into local high school classrooms, and an English teacher and a dozen students showed up to meet Jeannette. Yeah, it was a “bring out the tissues’ moment for many of us. 7) “I was in the Miss Alabama pageant seven years in a row. My talent was playing two grand pianos while standing in Mississippi Mud.” Keynote speaker and comedienne, Fanny Flagg (author of Fried Green Tomatoes at the Whistle Stop Cafe and I Still Dream About You) kept us guffawing with her life stories. She also included more poignant revelations such as her battle with dyslexia—which almost prevented her from writing. Dog fordib! 6) “The glamorous life of an author…I just skulked out of the bathroom with my breast pump.” Jeanine Cummins (author of The Outside Boy—one of BCC Top 10 picks for 2010) confessed during her panel discussion with hosts, Robert Leleux and Kathy Patrick (AKA: BobKat) it must be tough traveling when you have an infant—and a girl’s gotta do what a girl’s gotta do! I would also like to take this opportunity—it is my blog, so I can—to thank all of the authors and book clubbers who joined me down the rabbit hole (the afore-mentioned skit): Sandy Briggs, Kathryn Casey (author of The Killing Storm), Sarah Deutsch, Marcia Fine (author of Paper Children: An Immigrant’s Legacy), Jamie Ford, Leesha Ford, Karen Harrington (author of Janeology),and M.L. Malcolm (author of Heart of Lies)—we had a fabulous time making fools of ourselves—but it was all for a good cause! 3) “The REAL James Bond was a GIRL!” Of course, at a girlfriend’s weekend, this line practically got M.L. Malcolm (author of Heart of Lies —one of BCC Top 10 picks for 2010) and the upcoming Heart of Deception) a standing ovation. The story goes that Ian Fleming—the father of all the James Bond novels—was ‘friendly’ with a certain female spy and that she was the inspiration for the Bond character. In M.L.’s book, her protagonist, Leo Hoffman, becomes friendly with this same female spy… On a different note, M.L. also mentioned that she had personally visited over 70 book clubs last year—due to her husband gigantor frequent flier account. (Thanks, John!) So email her—she just might show up at YOUR book club meeting! 2) “Pulpwood Queens Girlfriends’ weekend is a vast ocean—of estrogen and creativity” Keynote speaker, Pat Conroy, went on to explain that after speaking at last year’s event, he was inspired to go home and write his latest book, “My Reading Life”. We’ll take that compliment any day! 1) “I got kicked out of a leper dance” That is not a typo! Now, many of us can say we were kicked out of places—I meant, stuff happens—but a leper dance? You will have to read Neil White’s memoir, In the Sanctuary of Outcasts” about his prison sentence for a white collar crime, which he served in a combination prison and leper colony. Folks, you just can’t make this stuff up! Are all these people crazy? Perhaps. But the real crazy people are the ones who don’t attend this wild event—I’m telling you that your club needs to be there next year! BTW, because of the success of the PWQs, and GFWE, Random House has partnered with Kathy Patrick to host a new on-line book event titled, Beauty and The Book Show. If you love books, authors, and book clubs, you’ll want to check it out! I can’t wait to see the one with Lisa See—one of my favorite authors! ← What’s Your Book Club Sign? Marsha — it looks like the weekend was a blast! Great pictures… and great quotes! Thanks, Dana. You HAVE to go next year–it is too much fun! OK, Marsha TE is brilliant! What an INCREDIBLE, natural-born journalist! Really! Has anyone ELSE captured the heartbeat of last weekend like THIS?!!!! Good thinkin’ on that underpants thing! My readers will be relieved! Thanks, Cathie. wow. surreal. Impossible to believe unless you’ve been there. That’s the point, Ad–you WEREN’T there! 🙂 Missed you! Kathryn: Add to that, last year’s song, “Somewhere over the rainbow book clubs flee…” and then the theme song for the new Beauty and the Book Show…my head is one big mix tape! Marsha, this is the BEST description EVER of GFW! You have totally captured the energy and spirit of that fabulous weekend. I’m so flattered to be included in the sound bytes (although I might have to add, “I finally got into Pat Conroy’s pants,” spoken by ANONYMOUS). M.L. : I figured that sound-bite had a little bit too long of an explanation…I also left out one of Bernie’s–because it was x-rated–and my blog is “G”…:-) Thanks for the soundbite(s)! Marsha, I’m so honored to be #1 on your list. Great meeting you, too. Can’t wait to come back to Girlfriend Weekend soon! Neil: My sister had to call me for an explanation of your sound-bite! Thanks for the great line for my blog! Marsha you have totally captured the spirit and comradery of GFW! I’ve read The Killing Storm which is the best Sarah Armstrong mystery by Kathryn Casey yet; one of our members read Neil White’s book as soon as she got home and called to say she loved it and can’t wait for us to read it [of course it’s set in Louisiana 🙂 ]so now I’m looking at my 30 inch stack of TBR and wondering which one next. Great to see you again and looking forward to next year.